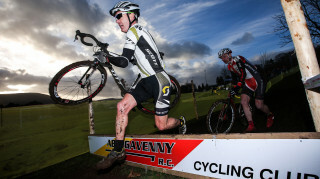 Crosstober Wales took place at King Henry VIII School in Abergavenny, the same venue that played host to the 2015 National Cyclo-Cross Championships. Saturday 22 October featured King Henry’s Cross, a British Cycling Category A race for the popular and hotly contested Welsh Cyclo-Cross League. Proceedings commenced at 10.00am with racing for the Under 8s, and continued throughout the day, culminating in the Senior and Junior Men’s race. Sunday 23 October featuredthe National Trophy Series Round 2, a UCI 2 race attracting riders from all over the UK and Europe. Although the two days of racing took place at the same venue, Sunday’s course was different to the one used on Saturday, ensuring high level cyclo-cross racing throughout the weekend. In addition to the racing, spectators will be able to the explore the event village, which will feature numerous cycling related trade stands, including local frame- builder Sturdy Cycles and the ever popular Big Bobble Hats, suppliers of bobble hats to Abergavenny RC. The festival’s races will be covered by S4C, with live TV coverage on 23 October of the Elite Women’s and Men’s races, plus highlights of the other races. Whether as a competitor, a spectator or an armchair fan, this is a weekend of cycling not to be missed. For more information visit Crosstober Wales.